It's no secret that the 2017 season has been rough for not only the drivers at MIR but the race fans as well. Mohawk International Raceway officials are hoping for better weather this weekend as all 5 divisions will be set to tackle a fast racing surface which will make our dedicated race fans much happier than sitting around in the rain. With only 3 events complete in 358 Modified competition some of the top stars in the 358 ranks have had success at other speedways and are hoping for a little momentum when the action resumes this coming Friday night. Tim Fuller recently took home a victory in the Graham Racing big block Modified number 19 by topping Stewart Friesen and Ronnie Johnson at the Fonda Speedway. Billy Dunn also continued his dominance by remaining undefeated in 358 Modified at the Can-Am Speedway. These 2 drivers will look to keep the roll going this weekend but with guys like Jordan McCreadie, Chris Raabe, Corey Wheeler, Brian McDonald and Danny Johnson in the field, it could make for an action packed 358 Modified feature. 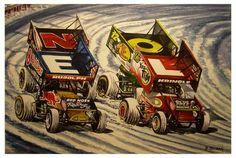 Our local Sportsman drivers have also had great success since Mohawk has been held down by Mother nature. Moise Page is on a hot streak at the Airborne Park Speedway on Saturday nights in 2017. Page has recorded 3 victories this season and will look to add his 2nd career Mohawk checkered flag Friday night. Johnathon Ferguson has also been strong at his Saturday night home the Brockville Ontario Speedway with a big win and a string of strong runs, the Prescott Ontario native will roll through the gates Friday as the points leader. Drivers like Zach Arquiett, Joel Hargrave and Brianna Ladouceur will all be up on the wheel and will be hungry for a win this weekend as well. Gates open at 5:00pm just $12 general admission with Canadian Money also taken at par at the main gate, Seniors and students $10, children are always admitted free. Pit admission is $27 with a DirtCar membership $30 for non members. The first green flag flies at 7:30pm. For more information log on to www.mohawkspeedway.com or contact the speedway office at 1-518-358-9017.